we have new owners and one of the first rules was “No decorations OUTSIDE of your apartment!” Well you don’t fool around with old folks!! Jackie joins Geri and Arthur! Can you see the full working train at the bottom of the tree? 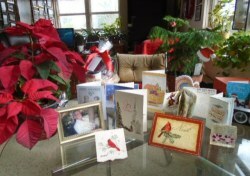 My Christmas table before I got more cards—see still at top of post taken today.